Looper – Go East Young Man. Ignoring all the paradoxes and plot holes that come with time travel, Looper is a cool flick. Don’t think too hard about things and you’ll be just fine. 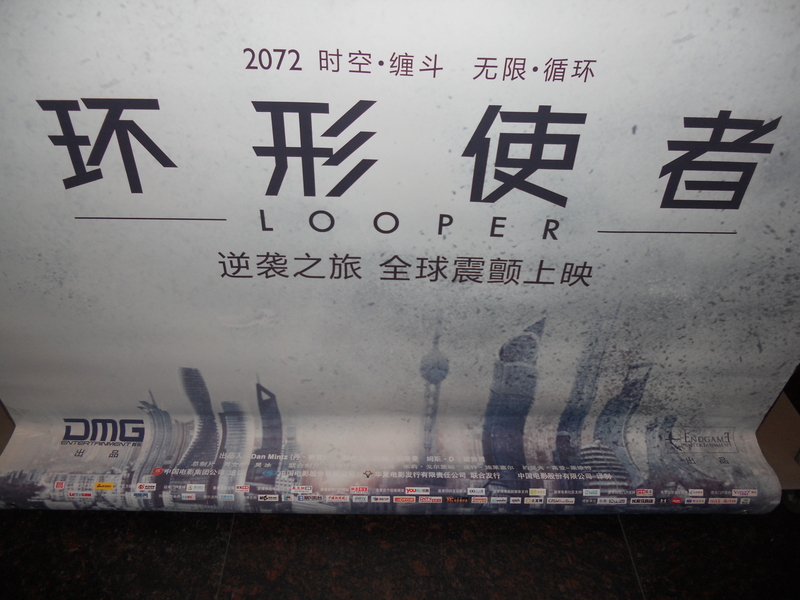 Right now Shanghai is bombarded with ads for Looper “环形使者” (In Chinese.) 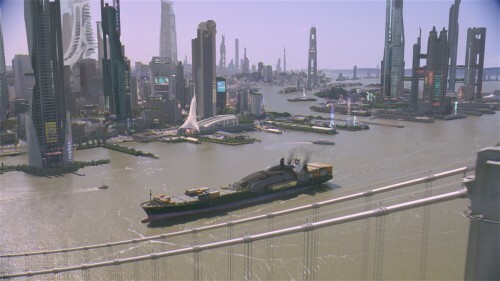 This makes sense , cuz well , Shanghai gets a futuristic 2072 makeover via CGI in the movie , and it looks pretty damn impressive. Going past the movie biz’s tendency to over exaggerate things ( I’m waiting for Blade Runner’s 2019 Los Angeles) the way Shanghai looks in the future is totally believable. 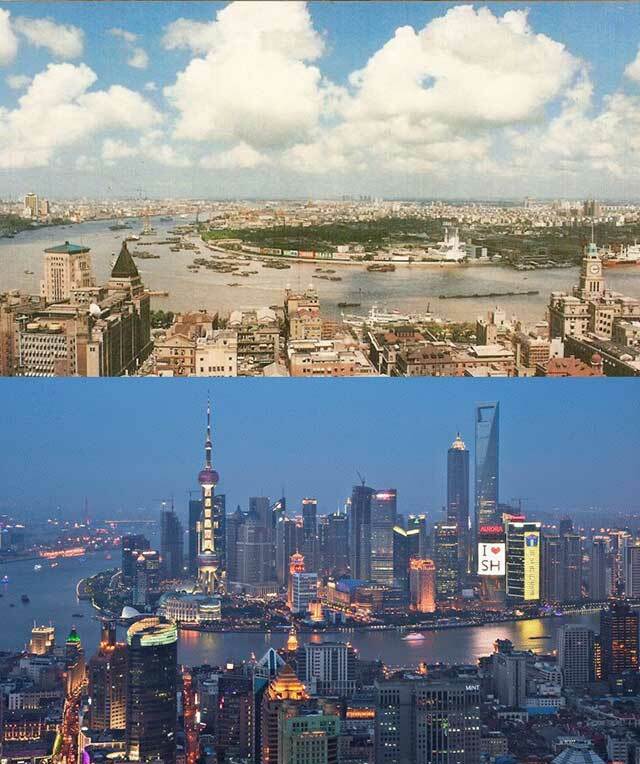 I’d say more believable than Shanghai’s real life 1990 to 2010 transformation. Yea , this is real. I can’t find any pictures of the Looper version of that skyline online right now. (I’ll have to wait for the pirate DVDs to hit the stores any day now.) but here is a Looper view on another part of the HuangPu River . Without giving the story away , in the future the U.S doesn’t seem to be doing the best with social breakdowns and rampant crime in the cities. Our main characters travels to a glistening and glimmering Shanghai. (For about 10 minutes and then all hell breaks loose and it’s back to Kansas in the past) Oh yea, and RMB is used as a black market currency in the US. Apparently us viewers in China got treated to extended Shanghai scenes , and scenes with the main character’s wife that were originally cut from the U.S.A version . I’ve heard that we in China missed out on drug use scenes and some toplessness. (Damn!). It probably helps that the film was also co-produced by the Chinese. It would also appear in China we also got customized ads with Shanghai’s skyline inserted into the movie posters even though only 10 minutes or so of Shanghai actually shows up in the film. Cornfields would perhaps be more appropriate. Cambodia is a country with a rich historical and cultural background. It was a collection of Indianized states in the 3rd , 4th, and 5th centuries absorbing influences from India and spreading culture and knowledge to present day Thailand and Laos. By the 9th century A.D the Khmer empire was a mighty powerhouse with huge influence in Southeastern Asia. The mighty capital of Angkor was built-in those times to rule over the kingdom. Researchers claim that Angkor was the world’s largest pre-industrial city , spanning over 1,000 miles and capable of supporting up to a million people. I was awestruck the entire time I was in Angkor and wish I could see in during its peak. When the crumbling ruins (being restored and preserved) were at their mightiest. When all the towers , spires , intricately carved murals , and statues were new and at their most intimidating. I can only imagine how a visitor from a rural village might have felt when he came upon the stone bridge lined with larger than life carved stone guards holding a serpent acting as a railing which bridged the moat leading to the super-intricately carved murals and strikingly beautiful nymphs smiling mysteriously downwards. The nymphs with a mysterious smile and eyes just beckoning you in. Who were these people who made this temples almost 1,000 years ago?? After the decline of the Khmer empire in the 15th century it has been a kind of dark ages for the Khmer people with the culmination in the 1975-1979 massive destruction of the country. Ever since the Angkor kings fell it has been a tale of subjugation to neighboring kingdoms/countries , colonial rule by the French , bombing and mining of the country by the Americans , and then Pol Pot’s maniacal rule. Things have only started turning around in 1993 when the last Khmer Rouge fighters started to lay down their weapons. In the last decade Cambodia has been the amount of visitors explode ( not with bombs but with numbers) in 1993 there were 118,183 international tourists, and in 2009 there were 2,161,577 international tourists making tourism the #2 economic staple after textiles. Direct foreign investments are also taking off with China leading the way. All over Cambodia (I also saw this while in Laos) there are Chinese companies buildings bridges , roads , and factories. Signs with Chinese characters proudly proclaim the investments and improvements alongside these projects. The amount of Chinese tourists has also dramatically increased as China’s economy has created a huge middle class with enough money to travel to other countries and as the Chinese government has loosened travel restrictions for its own people. For an example of how insane the Khmer Rouge and Pol Pot were think about this , the Rouge wanted to created an egalitarian agricultural society and evacuated the cities. The villagers that grew food and crops didn’t get to keep their own produce. It was centrally redistributed but often the government would sell the food to other countries to get cash for war supplies. They exported rice to China while hundreds of thousands of people starved to death. They also distrusted anyone with an education. If you wore glasses (cuz ya know that makes you smart) you were killed , teachers , doctors , and engineers all were executed. Let’s kill all the engineers and then have the farmers build dams , totally good idea! People were tortured to give false confessions of being CIA spies and then their whole families were murdered as well. All in all the Khmer Rouge exterminated nearly 1/3 of the entire population of the country at the time. 2.3 million out of 8 million people is a commonly quoted number. All this happened so recently (1975-1979) that whenever you meet the old three-toothed man with the huge smile and the super friendly attitude you know that he was made to endure all that. He saw his country f***ed completely over and he surely knew so many that died. This kind old man had to be separated in his family and live in communes while people were executed all around him. It really breaks the heart. My Cambodian friend I met was only 28 years old. That means he was conceived not too long after the madness was quelled. He was probably born then because his parents thought it was finally safe to have a child. You see the Khmer Rouge spared no one. They would murder babies by smashing them into trees because it was believed they were a drain of resources , had nothing to give, and since the Rouge murdered his mother, father , sister , and brothers , perhaps when he grew up he would want revenge. Parts of the country are still heavily landmined and you will see limbless people wandering around and begging. These mines are the fault of the U.S as well the Rouge but the effects of war are super evident. Crazy , crazy , stuff. Like I said before , things are looking up for the Cambodian people ( over 50% under age 21). Dollars from abroad , more tourism , skyscrapers being built-in Phnom Penh , the future finally looks good! I’ll go more into the natural landscape and information about the cities in upcoming posts. Soon, soon!! I promise!